Detached Cottage For Sale in Pwllheli for £365,000. 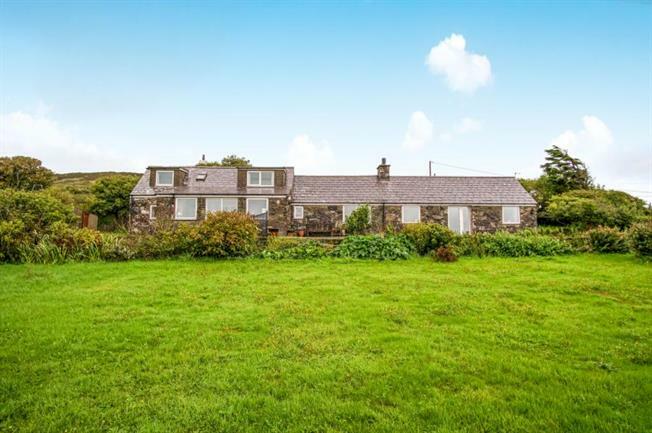 A Beautifully positioned detached stone built period residence in an enviable rural setting with magnificent far reaching views towards the Irish Sea and Bardsey Island and across the Southern tip of the Lleyn Peninsula. Originally farm buildings dating back to the 1840's, they were converted in 1976 to provide spacious family accommodation with oil fired central heating, retaining many character features with a splendid Sitting room with Gallery /Kitchen/diner, utility room, Front Sun room, 3 bedrooms and shower room, bathroom and 2 further bedrooms to the first floor. Extensive grounds and gardens surrounding the property enjoying much privacy with excellent vehicular/ boat parking within the gated entrance. 2 useful stores/ workshops, separate field with a former vegetable garden and Greenhouse. Extensive raised crazy paved sun terracing to front elevation, lily pond. Rhiw is a designated area of outstanding natural beauty with beautiful country walks to enjoy from the property across the amazing landscape with the picturesque seaside village of Aberdaon some 3 miles distant.